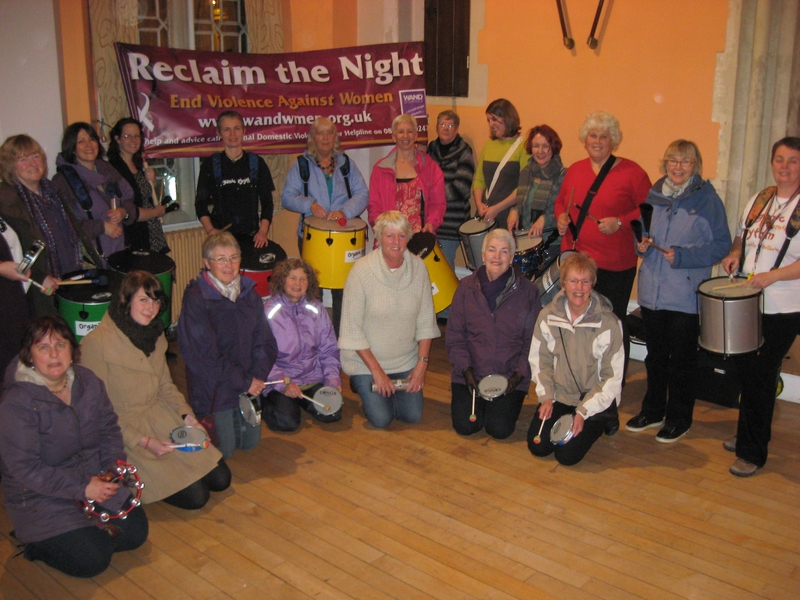 Here is a photo from the Reclaim the Night event on Saturday to highlight the International end Violence Against Women day and campaign that was held by the Women’s Action Network Dorset (WAND) at Dorchester Town Hall on Saturday night.The event began with a drumming workshop with the excellent ‘Organic Rhythm’. 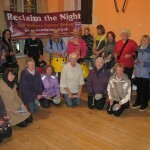 Once we were warmed up and had learnt some samba rhythms, we took to the streets, despite the rain, with our drums beating out a shared song to ‘reclaim the streets’. We had a great response form those brave locals who were also out in the rain and had people joining in and dancing as well as waving us on. Then we went back to the Town hall where we had a shared supper and held an auction to raise money for children living in the West Dorset Refuge this Christmas. The auction prizes were donated by local business, who despite difficult times were extremely generous and helped WAND to raise over £200 which will be used for the children living in the refuge this Christmas to go to the pantomime and give them a bit of money to buy a present for their mum. If there are any women out there who are suffering in this way there are places that they can go for help. They can call the West Dorset Refuge helpline which is staffed 24 hours a day on 01305 262444 or contact the countywide outreach service – Youfirst on 0800 0325204. This entry was posted in Uncategorized on November 28, 2012 by sueb.